Last week I recommended the free Phonics Hero app* for the iPad to a colleague, but the next day she told me, to my dismay, that it was no longer available in the Australian apps store. Oh no! It was one of my very, very favourite apps for children aged 4-7 (and even little older) who were still learning the absolute basics about letters and sounds. I was working with a 5-year-old with an Autism Spectrum Disorder just the other day, and he got a terrible case of the whiny-I-don’t-want-to’s at every literacy activity I presented to him, except this one, which he wanted to keep doing, till I had to ask him to stop. It has simple graphics and activities, crisp sounds, funny rewards, helpful hints, and a well-organised teaching sequence, all in a young-child-friendly game format with an escape narrative. There are bubbles to pop, flies to swat, laughing ghosts, treasure chests, ladybirds to colour in, an ice-cream-eating giraffe, a brick-smashing troll, a brewing witch and lambs to spray-paint (apologies to the RSPCA). The app includes an incredible 470 different games, so it’s going to take me a while to work my way through them all, but one problem with the original version – slow screen response on some games – has been sorted out, so that correct responses now get immediate rewards. If you know a Kindergarten or Early Years teacher who doesn’t know about this app, please tell her or him about it, or better still, download it and let them see how great it is first-hand. The jump-the-frog activity near the start is still too long for my learners, so please keep an eye out for it and help your child through to the end if they’re flagging. There is one activity that involves counting sounds in the absence of letters (watch out for the bumblebee), which I probably won’t use. The literacy research is pretty clear that working with sounds and letters together is where you get the real literacy-learning bang for your buck. Some of the “sight” or “camera” words (e.g. she, day, he, day, me, for, no), are from my point of view decodable, so I’d prefer that this be made clear from the start (sh-e, d-ay etc) rather than encouraging children just to think of them as chunks to memorise as wholes. Apart from these fairly minor issues, I can hardly think of anything that doesn’t look absolutely excellent about this app for its target audience, including the price tag for the first section of it: $0! Well done! 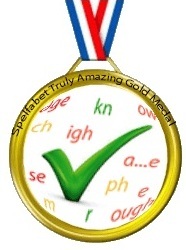 Definitely deserving of the coveted Spelfabet Truly Amazing Gold Medal. *1/7/15 Update: The Phonics Hero Classroom app has been discontinued, but Phonics Hero is still in the apps store and available by subscription online, and I still think it’s great. Please note that the links to Phonics Hero on this page are now affiliate links, meaning that if you click on them and then sign up, I will receive a small commission. I decided that since I’d been recommending this program to people for free for more than two years, I’d accept their offer of an affiliate link. This entry was posted in Fun, phonics activities, phonics games, reviews, sound-letter links on April 17, 2013 by alison. i can't find 'phonic hero classroom' on the App Store. I found 'phonics hero lite'. Is it the same? Hi, yes "classroom" and "lite" are one and the same. Sorry for the confusion and thanks for the lovely review! I can't find Phonics hero app in any form on the App store- do you have any current information? Hi Katrina, sorry for slow reply, life has been too busy lately and I haven’t been checking my comments regularly. I can’t find Phonics Hero either! Aghast! I will see if I can find out what’s happened to it, it’s from Get Reading Right. The company Get Reading Right does not support this new, expensive version of Phonics Hero. I have asked Phonics Hero, through legal counsel, to remove all mention of Get Reading Right from its website. I have also requested that they remove my name and image. They refuse to do this. Please do not post that Phonics Hero is supported, or is in any way, linked to Get Reading Right. If you would like a copy of the Cease and Desist legal letter sent to Phonics Hero please contact me. Get Reading Right Pty. Ltd. Thank you Alison. I appreciate your response. since Phonics Hero is no longer associated with Get Reading Right….Do you still give the Gold Star to the current version?